So far, everywhere we've found water, we've found life. A new study, accepted for publication in the Geophysical Research Letters, suggests that Dione, one of Saturn’s moons, may be home to a huge subterranean ocean. Researchers from the Royal Observatory of Belgium used computer modeling techniques and publicly available data from the Cassini mission to Saturn. They believed that gravity data of Dione taken by Cassini flybys can only make sense if the moon’s crusts float on an ocean of water about 100 km (62 miles) below the surface. Dione would be the third of Saturn’s icy moons said to have water, next to Titan and Enceladus. The computer modeling assumed Enceladus and Dione as global icebergs immersed in water, where a large underwater keel supports each surface icy peak — an approach previously used by researchers, yielding results that showed Enceladus to have a very thick crust and no ocean for Dione. 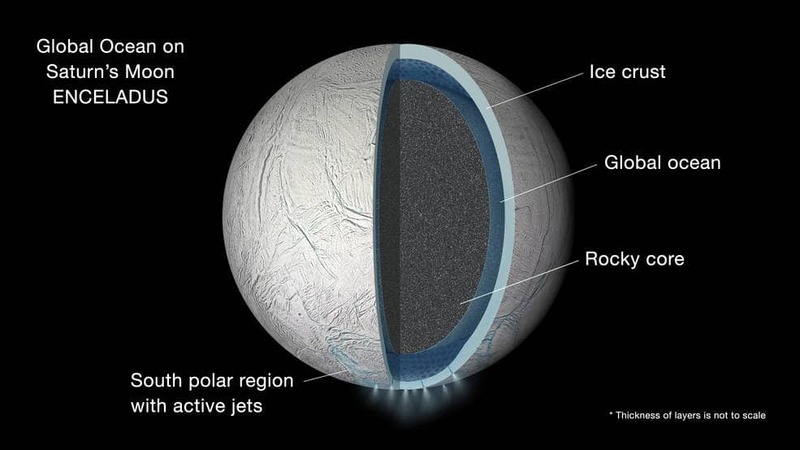 Mikeal Beuthe, a planetary scientist and lead author of the study, explains how they had to assume that an icy crust, especially for Dione’s case, can only take the least amount of tension and compression needed “to maintain surface landforms”. They new model showed how Dione’s ocean would surround a large rocky core and was probably several tens of kilometers deep. It’s an interior very similar to Enceladus. Most of the recent studies regarding the search for potential life outside of Earth have all been focused on finding water in exoplanets or moons. These so-called ocean worlds three of Jupiter’s moons, now three of Saturn’s, as well, and Pluto with it’s icy heart — with Mars considered to be (previously) watery, too. The presence of water makes any world a prime candidate for life, which is why NASA has made “follow the water” its rallying cry in the search for extraterrestrial life. “When we find water here on Earth […] we’ve found microbes that have found a way to make a living there,” said Brian Glazer, an oceanographer at the University of Hawaii. What’s true for the Earth’s oceans might also prove to be true for the seas of space and other planets.